Female macroptera. Body bicoloured, mainly brown with abdominal segments IV–V and IX–X yellow; tibiae and tarsi yellow, also antennal segments III–VIII; fore wings pale at base with long dark band medially, then paler before dark apex. 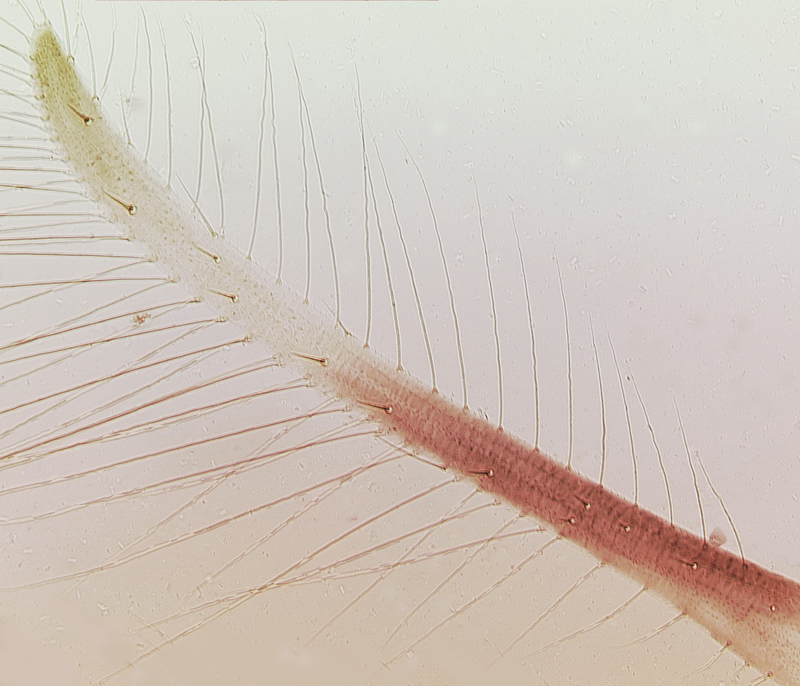 Antennae 8-segmented; III–IV with sensorium simple, surfaces without microtrichia. Head longer than wide, strongly projecting in front of eyes; ocellar setae varying in number, up to 3 pairs present, pair III anterolateral to ocellar triangle; postocular setae small. 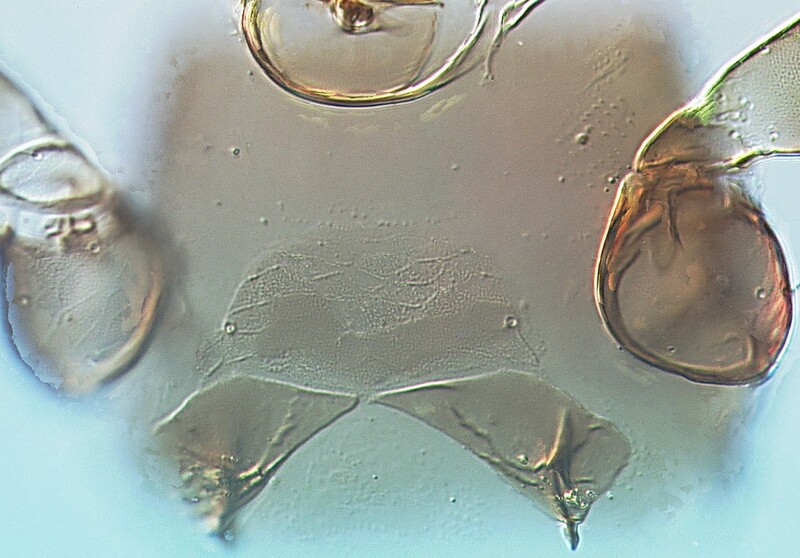 Pronotum with 2 pairs of posteroangular setae of which the outer is half as long as the inner; posterior margin with 2 pairs of setae. Fore tibia with distinctive large seta at inner apex with fimbriate apex. Metanotum very weakly reticulate, campaniform sensilla absent; median setae arise on posterior half of sclerite. Meso- and metafurca without spinula. Fore wing curving forward at apex; first vein with 2–3 setae on distal half, second vein with about 4 setae. 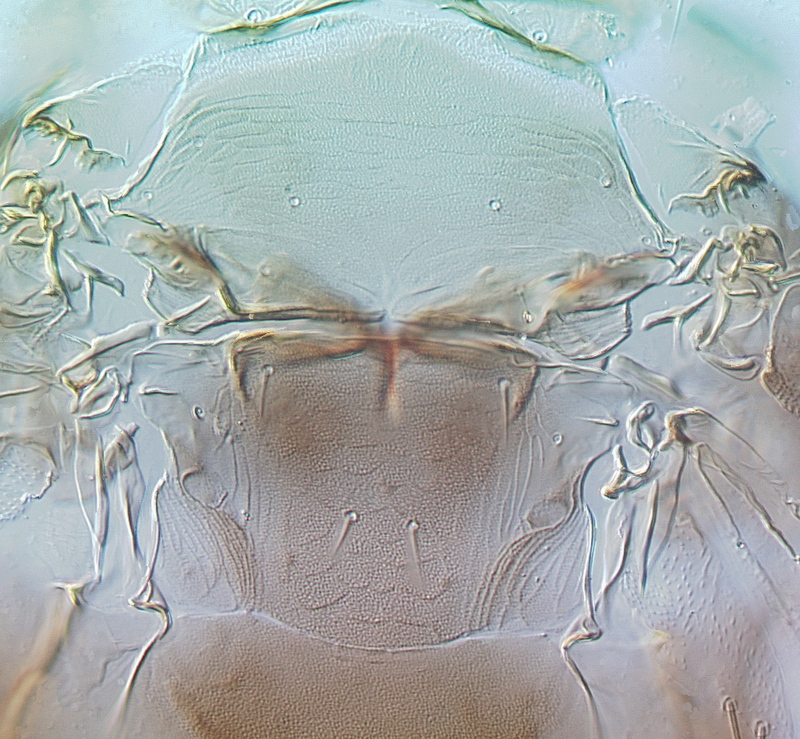 Tergites I–VIII with posteromarginal fringe of irregular microtrichia, often arising in groups from small craspedal lobes; median area of tergites with transverse lines of sculpture; median setae small, on posterior half of sclerites between campaniform sensilla. 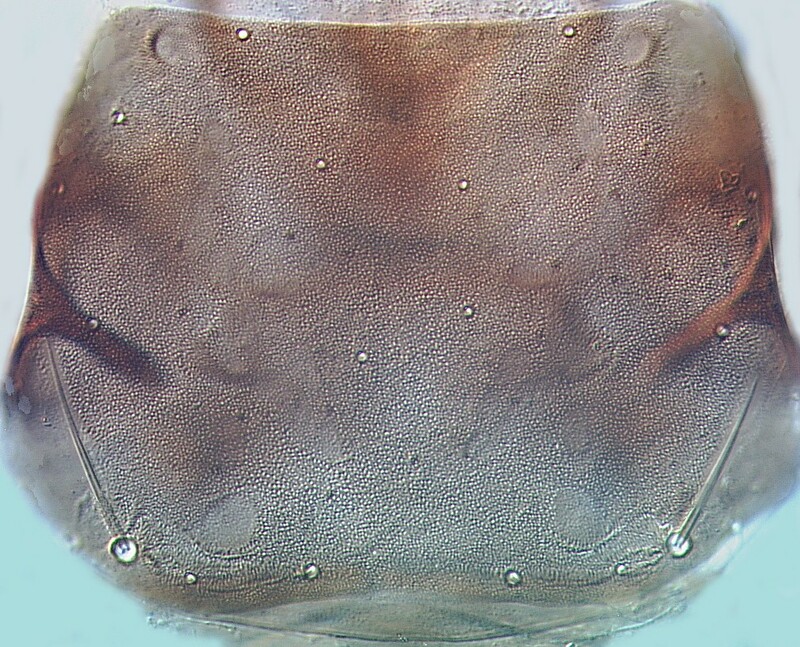 Sternites without discal setae; posterior margins with small dentate microtrichia laterally, marginal setae small. Male aptera. 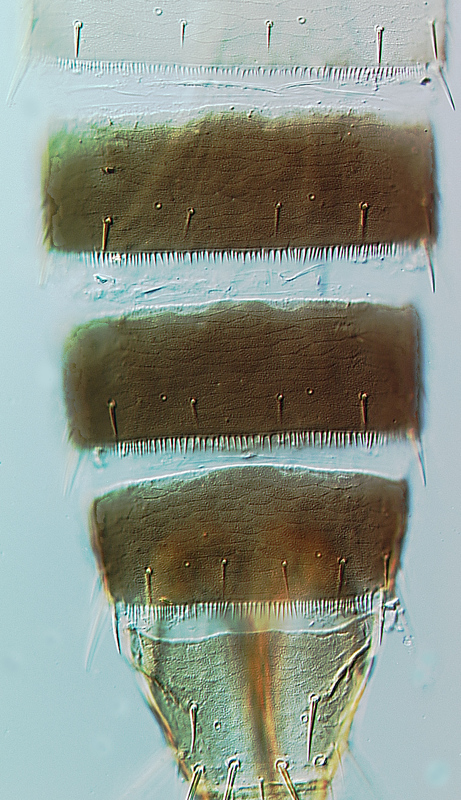 Body yellow, smaller than female; meso- and metanotum transverse; tergite IX with pair of long stout discal setae; sternites III–VII with transverse arched row of up to 10 small circular pore plates. 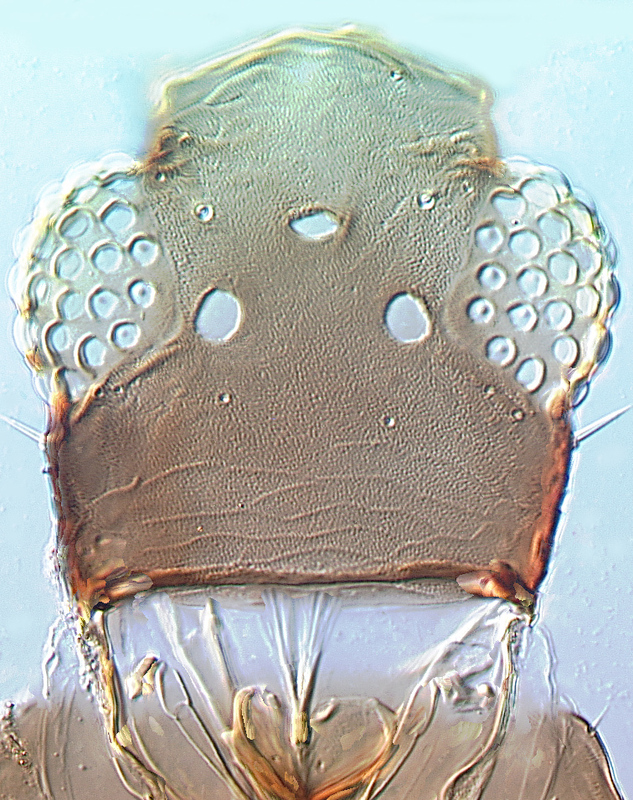 The genus Organothrips is distinguished by the head prolonged in front of the eyes, the trapezoidal pronotum, and the fimbriate craspeda on the tergites. Only three species are recognised in the genus, and of these O. bianchi from islands in the Pacific is particularly similar (Mound, 2000). Florida, Germany, India, Bangladesh, Hong Kong, Thailand, Australia. Mound LA. 2000. The aquatic thrips Organothrips indicus Bhatti (Thysanoptera: Thripidae) in Queensland, and a new species, O. wrighti, from tropical Australia. Australian Journal of Entomology 39: 10-14.